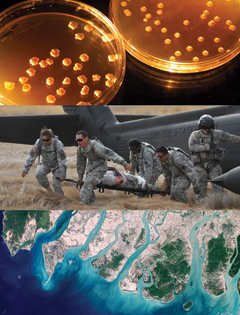 Volume 13 | DARPA | Biodiversity: a Source of Next Generation Military Power? Biodiversity: a Source of Next Generation Military Power? Birds can fly, fish can breathe underwater, cheetahs run at remarkable speed, reptiles show incredible regenerative abilities and bacteria amazing resistance to attack. The biodiversity of the planet is filled with what could be considered “super-powers”, and scientists and researchers with DARPA are now looking to that world to bring the Next Gen advantages to US warfighters. 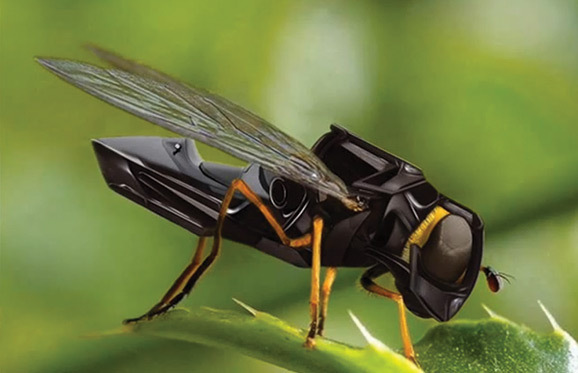 DARPA Robo fly Photo: © Darpa. Recent progress in such diverse disciplines as neuroscience, sensor design, microsystems, computer science and other long-standing areas of DARPA investment has been converging rapidly over the last few years, revealing newly emergent possibilities ready to be realized. Forming BTO was the next logical step to harness that potential. Restore and Maintain Warfighter Abilities: Because military readiness depends on the health and wellbeing of service members, a critical focus is on cultivating new discoveries that help maintain peak warfighter abilities and restoring those abilities as quickly and fully as possible when they are degraded — including through the development of advanced prosthetics and neural interfaces. BTO will seek to develop new techniques and therapeutic strategies for addressing current and emerging threats, but its work will extend beyond medical applications to include exploration of complex biological issues that can affect a warfighter’s ability to operate and interact in the biological and physical world. Harness Biological Systems: The highly evolved functional and synthetic capabilities of biological systems can be harnessed to develop new products and systems in support of national security with advantages over what even the most advanced conventional chemistry and manufacturing technologies can achieve. BTO seeks to establish a fundamental understanding of natural processes and the underlying design rules that govern the behavior of biological systems and apply that knowledge to forward-engineer new systems and products with novel functionality. Apply Biological Complexity at Scale: Biological systems operate over an enormous range of spatial, physical and temporal scales. Some organisms thrive as individual cells but most depend on dynamic interactions with other species. A better understanding of the interactions between mammalian and non-mammalian species and micro- and macro-organisms could foster new approaches to enhancing mental and physical health in routine and threatening situations. Similarly, disease vectors migrate around the globe slowly and stealthily at times, and at other times in devastating waves of breathtaking speed — reflecting poorly understood dynamics that can undermine national security. BTO is looking into pursuing new insights derived from biological complexity and living-system dynamics with the goal of developing applications to enhance global-scale stability and human wellbeing.